Dr. Moadel is an Assistant Professor, Dr. Feng is an Assistant Professor, and Dr. Freeman is a Professor and the Vice Chair, Department of Nuclear Medicine, Montefiore Medical Center, Albert Einstein College of Medicine, Bronx, NY. 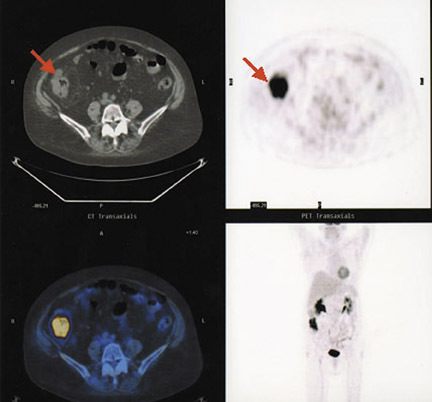 The imaging combination of 2-deoxy-2-[18F] fluoro-D-glucose (FDG) and positron emission tomography (PET) with computed tomography (CT) has revolutionized the evaluation of colorectal cancer in terms of staging, restaging, accurately assessing response to therapy, and surveillance of the “cured” patient. However, pitfalls exist; these include bowel uptake due to physiologic, iatrogenic, and infectious and inflammatory processes. The key to being able to differentiate malignant disease from artifactual uptake within the bowel often lies in pattern recognition and the ability to triangulate FDG uptake to normal- or abnormal-appearing bowel on CT. 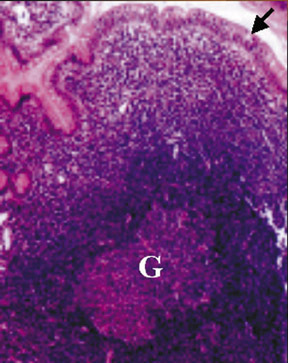 Using this pattern recognition, PET can be useful in identifying incidental premalignant or malignant lesions, and infectious and inflammatory bowel disease. An understanding of the physiologic processes that account for nonmalignant uptake allows one to better interpret PET/CT oncology studies. Systemic medications, such as metformin, can increase bowel uptake, which generally results in an increase in large and small bowel FDG uptake in a diffuse pattern (Figure 2). This pattern does not appear to occur with other diabetic medications. Metformin acts to enhance transfer of glucose from the vasculature to the intestinal epithelial cells and thereby increases glucose utilization within the GI tract by up to 60% in animal models, mediated by glucose transporters (GLUT 1,2,4) and by activation of protein kinases within the glycolytic pathway. 9 These iatrogenic causes and patterns of artifactual uptake are important entities in the evaluation of bowel uptake and the differentiation of benign versus malignant etiologies. Despite possible intrinsic and iatrogenic causes for bowel uptake, the authors routinely recommend evaluation with colonoscopy when there is focal bowel uptake. This may be seen in patients being studied for an unrelated reason, such as a lung or breast neoplasm. 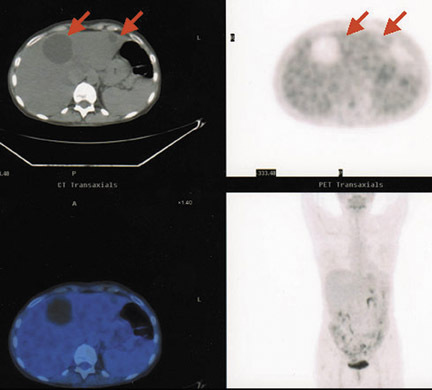 Since there are a significant number of incidental true-positive premalignant or malignant lesions, it is preferable for such patients to undergo further investigation rather than missing a lesion. The pattern of diffusely increased uptake within the bowel is not associated with findings of cancer on colonoscopy and is thought to be related to normal intrinsic or iatrogenic causes, while a segmental pattern is associated with infectious or inflammatory causes such as colitis. A nodular focal or multifocal pattern is associated with a high risk of premalignancy or malignancy ranging from 59% to 100%, 10-12 and colonoscopic evaluation is recommended. 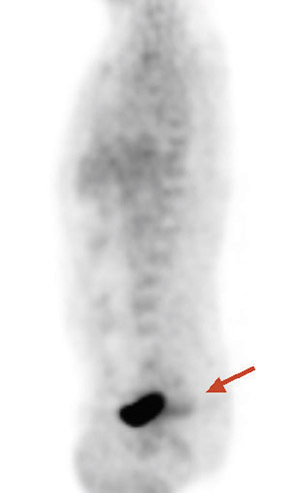 Examination of the simultaneously performed CT images often confirms the presence of a mass (Figure 3). It should be noted that lesions <1.7 cm are not detected on PET imaging. There is a correlation of standard uptake value (SUV) with severity of malignancy, 13 likely due to upregulation of the glucose transporter (GLUT 1) caused by oncogene expression 14,15 ; however, a cutoff value cannot be established due to significant overlap in SUV between low and high severity of malignancy. The aforementioned patterns should help to distinguish benign from premalignant or malignant pathology within the bowel. 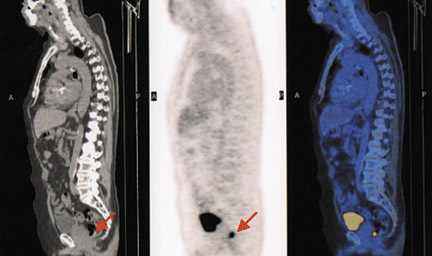 However, once the diagnosis of colorectal carcinoma has been made, usually by colonoscopy, the true value of FDG PET/CT is in the initial staging and detection of unknown disease that is not otherwise seen by other imaging modalities, and the resultant change that it directs in ultimate therapeutic management. After the initial diagnosis, a change of therapeutic management was instituted in 16% of patients with colorectal carcinoma due to PET findings of disease in unsuspected locations. 21 CT can provide additional information concerning these lesions. It should be noted, however, that local lymph node metastases are not reliably seen by any imaging modality. 21 Nahas et al 22 reported that 13% of patients with locally advanced rectal cancer had metastatic disease on subsequent clinical follow-up, and PET was able to detect this disease a priori in almost all of these patients. PET/CT is able to outperform other imaging modalities in the detection of disease, and, when compared directly with whole-body 3T magnetic resonance imaging (MRI), PET/CT detected more pulmonary and lymph node metastases. 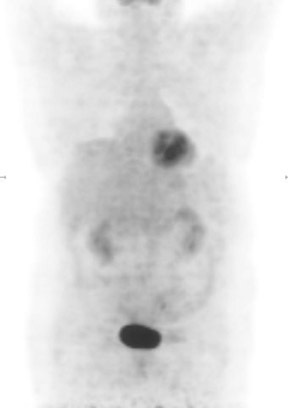 23 However, PET is limited in detection of hepatic lesions <1 cm because of inherent resolution limitations. 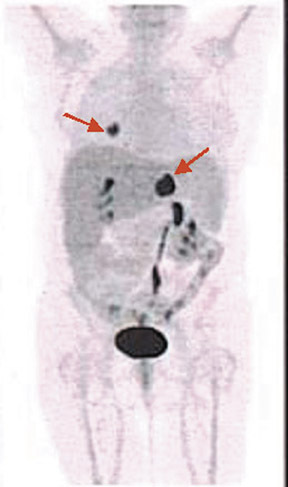 Contrast-enhanced PET/CT or manganese dipyridoxyl diphosphate (Mn-DPDP) contrast-enhanced hepatic MRI can be instrumental in revealing such metastases. 24 Interestingly, when patients are preselected for curative hepatic resection based on PET results, 5-year survival increases from a historically established 30% to 58% because of more accurate staging. 25 In addition, a change in clinical management is seen in 25% to 32% of patients. 26 PET/CT is also a valuable tool in the detection of synchronous primary cancers, thereby changing management to address additional malignancies such as lung, breast, uterus, and thyroid. 27 Primary lung lesions must be differentiated from colorectal metastases and treated accordingly (Figure 5). It should be noted, however, that PET is not sensitive in detecting mucinous colon cancers and can be a cause of false-negative results (Figure 6). 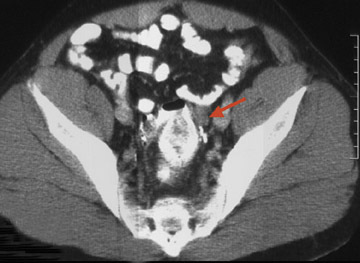 28 Given the value of detecting unknown disease and the effect on patient management, PET/CT is an important tool for the initial staging of patients with colorectal cancer. Patients with isolated pulmonary metastases often have longer survival following surgical resection, and PET/CT is an integral part of the staging process to identify those eligible for resection. 37 Additionally, PET is utilized to evaluate the success of recently introduced therapeutic techniques such as RF ablation of pulmonary metastases. 38 Hence the metabolic response to these local therapies (in addition to anatomic response and localization) is integral to determine the next steps in patient therapeutic management. In addition to monitoring local therapies, FDG uptake reflecting metabolic response to systemic therapies often predicts survival in a multitude of malignancies, including colorectal cancer. In patients with locally advanced rectal cancer treated with neoadjuvant chemoradiation therapy, those who showed complete FDG PET response are more likely to have longer disease-free and overall survival. 39,40 In patients with advanced colorectal cancer, >20% decrease in tumor SUV after 2 months of chemotherapy is associated with both longer progression-free and overall survival. 41 The evaluation of metabolic response early in the course of disease can predict survival and offers the opportunity to modify the chemotherapeutic regimen when tumors are unresponsive, thereby sparing patient exposure to noneffective therapies. At Montefiore Medical Center, the great majority of oncologists are monitoring “cured” colorectal cancer patients with PET/CT as opposed to PET or CT alone. 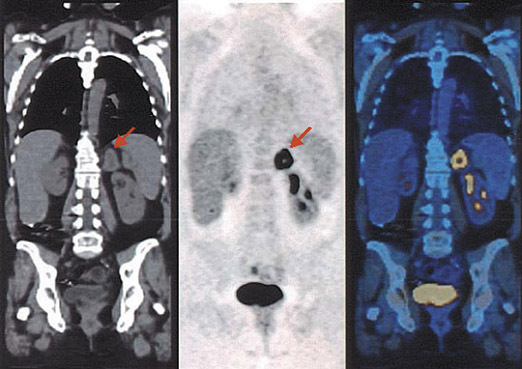 When recurrence or metastases are seen early with PET/CT and not necessarily seen on anatomic imaging alone, these patients are often at a treatable state of disease (ie, local recurrence, or surgically resectable hepatic or pulmonary metastases). 42-44 In evaluation of recurrence, PET/CT is able to detect more lesions than anatomic imaging alone, with high sensitivity (95%) and high positive predictive value (96%) 45 (Figure 8). 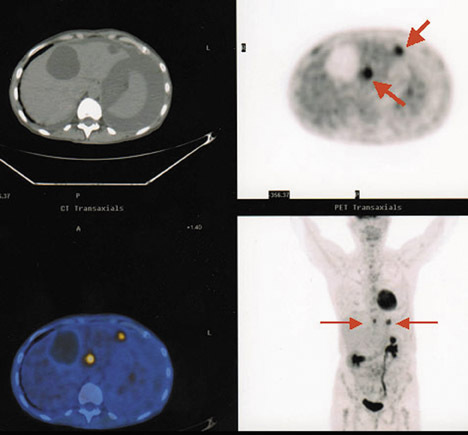 The addition of contrast enhancement to the CT portion of the PET/CT helps to definitively localize hepatic lesions to the correct segment, which is essential for surgical planning. 46 Often, patients are monitored with abdominal CT alone, with indeterminate results, in that postsurgical fibrosis cannot be distinguished from local recurrence. PET is especially useful in this situation, since fibrosis is not FDG-avid and recurrence will show uptake (Figure 9). 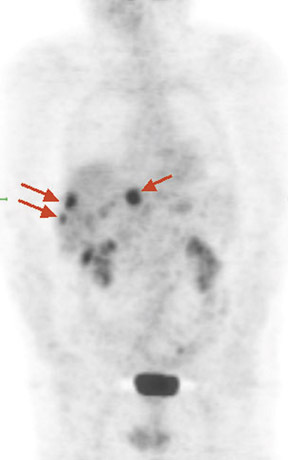 Finding the cause for elevated carcinoembryonic antigen in post-curative monitoring is often elusive on anatomic imaging but can be clearly elucidated on PET imaging with sensitivity of >95% (Figure 10). 47 In monitoring for recurrence, PET effects a change in therapeutic management in a substantial proportion (38% to 66%) of patients. 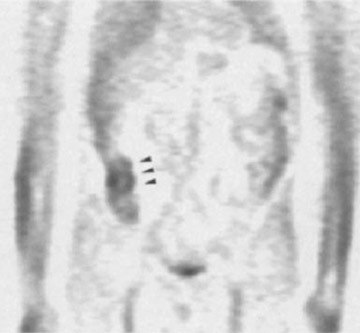 48,50 PET is able to provide prognostic information, 50 and PET/CT significantly improves restaging. 51 Thus, PET/ CT is the diagnostic modality of choice in monitoring patients for colorectal cancer recurrence, providing accurate restaging and guiding patient management. PET/CT is currently the preferred method for staging and restaging of patients with colorectal carcinoma. It also provides the most reliable means of monitoring patients for possible recurrence after a variety of therapeutic interventions, both for the primary lesion and sites of metastases. 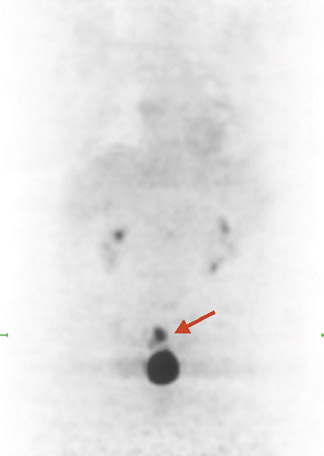 PET-CT in the evaluation of colorectal carcinoma. Appl Radiol.